Monuments can be incredibly moving just by their presence alone. Think of the simple, polished black granite of Maya Lin’s Vietnam Veterans Memorial in Washington, or the stately and austere white rows of crosses across the expanses of grass at Arlington National Cemetery. But others evoke greater power because of the story behind them. 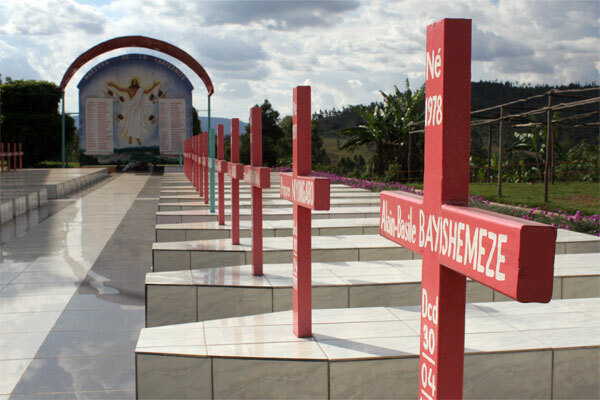 In southern Burundi, two rows of white-tiled coffin shapes, adorned with red crosses, mark the spot where some 40 students were slaughtered after defying a group of well-armed attackers when they besieged the Catholic seminary there in April 1997. According to witnesses who escaped, the students, all boys ranging in age from 11 to 19, were shocked awake in their dormitory with gunshots. The gunmen ordered them to divide themselves along tribal lines: those from one tribe would be conscripted into the attackers’ forces; those from the other would be killed on the spot. The boys refused to separate, saying they were all Burundians. The soldiers were given an order to kill them all, and they opened fire. It was a tragedy that shocked the conscience of the nation, and now serves as a powerful symbol for reconciliation as Burundi emerges from more than 12 years of civil war and ethnic violence between rival Hutus and Tutsis. 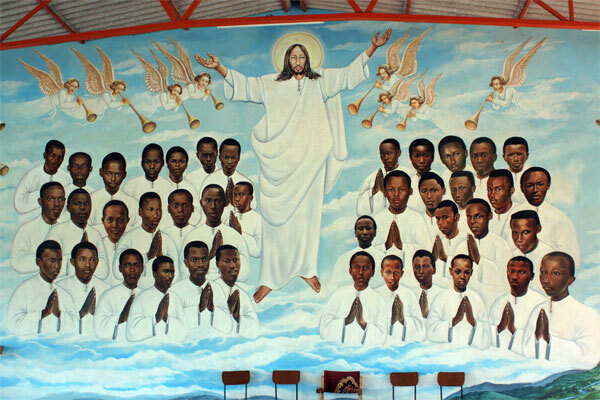 Inside a chapel at the memorial site, a painting on the wall shows the forty young men at the feet of Jesus. The portraits were painted using photos as models, so the faces are full of life. 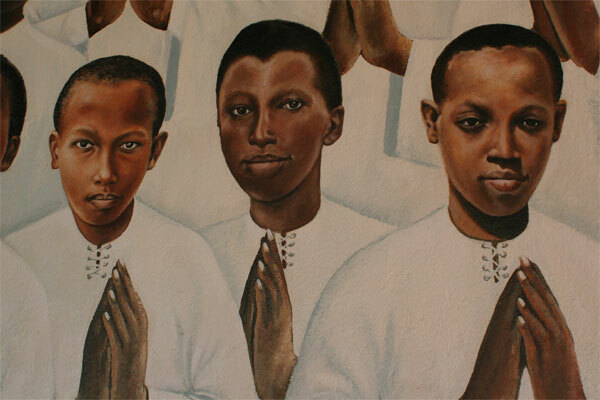 The young men all look directly at you, smiling, their hands clasped in prayer. It is haunting. Moving. Simple and profound. Another simple monument in Burundi — this one marking a happier occasion — stands about 8 miles from the capital city of Bujumbura. 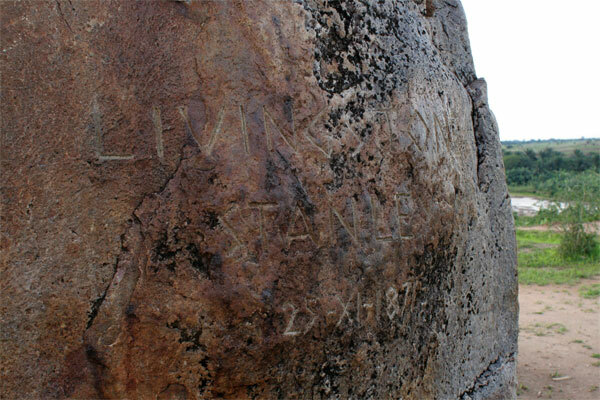 It is a large rock with incised carving of two names and a date: Livingstone; Stanley; 25-XI-1871. It is a place where explorer and missionary Dr. David Livingstone and the journalist/explorer who “found” him, Henry Morton Stanley, spent a few days as they traveled in the region together. It is not, as some will tell you, the place where Stanley first discovered Livingstone and uttered the famous line presuming his mission accomplished. That, according to Stanley’s book about the subject, happened in Tanzania. But Burundi does take pride in its connection to the famous pair. 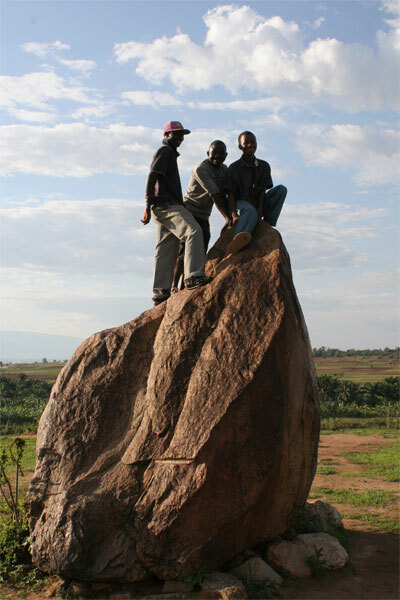 And the large rock sits in a beautiful spot, overlooking a stream that flows into Lake Tanganyika, the banks of which are about a hundred yards away. When I was there as the sun was getting lower in the sky, a few teenage boys climbed on top of the rock, showing off for a foreigner with the camera. Caught you living on stone, I presume? I am seething with envy in Jersey City. Not just over the rock, but over the entire experience. I need to get out more. Breathless over the painting.. it makes me sad, but very proud that these young boys have fought for each other. in heaven they will rest.